The Write Resume. Thank You Letters That Get Results! $20 off the preparation of your resume! Call now at 866-726-9052 to schedule your consultation or click on the "order now" link for secure online payment processing. Hurry - offer ends 11/30/2014 ! 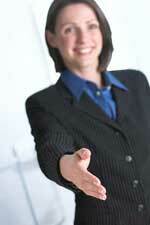 Only 1 in 300 people send a thank you letter to the Interviewer after their meeting. These individuals usually get the job! Let our firm customize a thank you letter, based upon your interview specifics.